The Hickory Museum of Art is the second oldest art museum in North Carolina. It officially opened on February 4, 1944 as the culmination of a five-year obsession of Hickory native and fledgling painter Paul Austin Whitener (1911-1959) to provide his home town with the kind of cultural mecca usually found only in much larger communities. In this endeavor Whitener worked with several other like-minded community leaders, as well as with his mentor the painter Wilford Seymour Conrow (1880-1957). Conrow in turn drew on his New York City connections to help Whitener start a collection of the mostly American art that to this day remains the primary focus of the Hickory Museum of Art. 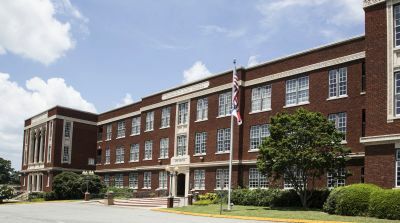 After being housed in four other locations, in 1986 the Museum moved to the dramatically renovated 1927 Hickory High School building. Here, the Museum is part of the SALT (Science Art Literature Together) Block Complex that houses several other cultural organizations along with the Museum. The Museum’s collection of over 1,500 works includes Hudson River Valley paintings, Art glass and pottery, works by North Carolina artists, and regional folk art. The Museum uses eight gallery spaces for rotating exhibits from both its own collection and from elsewhere, along with additional spaces for several semi-permanent exhibits. Most notable of the semi-permanent exhibits is Discover Folk Art, an immersive introduction to Southern contemporary folk art. The Museum’s annual event is its Lake Noman Folk Art Festival that draws several thousand visitors and provides a venue for folk artists to sell their works. Education has been an integral component of the Museum’s mission from the very beginning. Paul Whitener specifically wanted to encourage school students to be creative, and to that end he initiated an annual student art show. The Museum still hosts what is now the Paul Whitener Memorial School Art Show, sponsored by the Rotary Club of Hickory. The Museum continues Whitener’s educational goals in other ways as well, including through classes for all age groups offered year-round, and also through Art for All, the Museum’s community outreach program for the broader Hickory community’s largely underserved populations. Wells, Sherrie, "Hickory Museum of Art, SALT Block Campus." 2013. Image used by permission. Nichols, Hobart, "My Neighbors House." 1948. Collection of the Hickory Museum of Art, photo by Fanjoy-Labrenz. Image used by permission.